Georgia Avenue explodes into a colorful profusion this weekend. 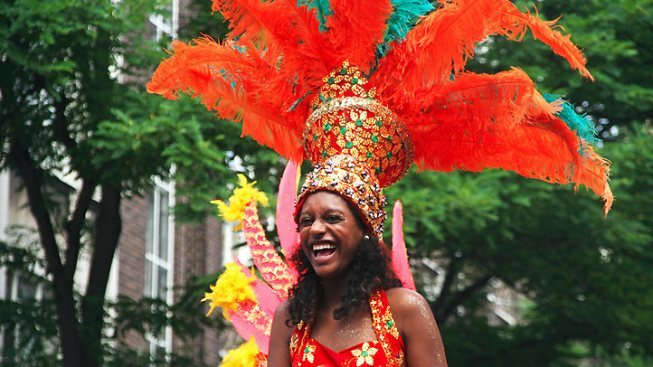 The 19th annual Caribbean Carnival parade, featuring the showy eastern Caribbean tradition of J’ouvert -- a procession of steel bands and dazzling costumes -- is this Saturday, June 25. The parade will start from Kansas Avenue N.W. at 11 a.m., making its way south to Georgia Avenue and Bryant Street N.W. The Caribbean Carnival Parade wowed viewers along Georgia Avenue. A festival will be held at the Howard Center from noon to 8 p.m., where you can sample international cuisines (admission is 10 bucks). The fest also includes crafts and a dance performance to mark the second anniversary of Michael Jackson’s death. "Caribbean Fest" has been a trending topic on Twitter among Washingtonians this past week. "Danggg ! Caribbean fest or NYC this weekend ? Tough choices :/" tweeted Emily Jenkins. And she isn't the only one thinking about making room for the celebrations. Benika Charrise wrote, "DC caribbean fest this weekend...may postpone my Philly trip." Sargeant said the event is to further an understanding of Caribbean culture. "We are fun-loving people; we are creative and very talented," he said. "We have a lot to share." The parade is expected to draw a crowd of about 300,000.